From the moment my daughter stopped living, I started to live For Her. I dragged myself up and out in the mornings, took care of her dog, dressed myself in her clothes and ate breakfast For Her. In a daze, I lumbered through every empty inch and hour of the day. I breathed For Her and put one foot in front if the other, one foot in front of the other, one foot in front of the other For Her. Because life was too painful to keep up just for myself. Back then, being stuck at home alone in a snowstorm would have been the end of me altogether. But I’d planned for this storm; shopped at Wegmans, bought a new book, borrowed a DVD. And today I shoveled a path in the foot-high snow for the dogs, after 3 walks (plods) in the deep snow, before the plow showed up. I re-wrote chapter 1 and composed a prologue. I cooked 3 entire meals for myself, paid the bills, and started to read a brand new memoir, Lucky Me, by Sachi Parker, about her life with and without her mother, Shirley MacLaine. The dizzying aroma of pears cooking in wine syrup filled the house like wild Cajun dance music. 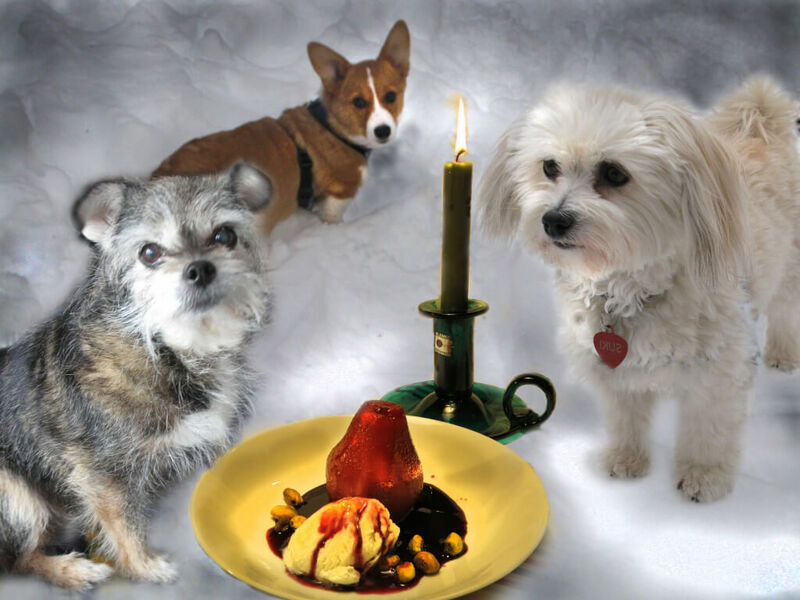 So dogs in a storm sit in the snow around Party in your Mouth Poached Pears with ice cream and pistachio nutsthe dogs and I danced around each other in the kitchen as I scurried from fridge to sink to stove. “I can’t believe I’m doing this just for me,” I say to them, only mildly sorry no one will drop by to share this simple but decadent dish. “More for me.” But I can share the recipe with my readers. Try it if you want to pamper yourself. Simmer pears uncovered for 10 – 12 minutes. Turn them over and simmer 8 – 10 minutes more. Remove pears and gently boil the sauce 10 minutes more. Place pears in bowl, drizzle a puddle of sauce. Add a scoop of ice cream if you dare. Sprinkle with pistachio nuts to add party and contrast. If you can control yourself, there’ll be leftovers for three friends who might show up at your door just when you think you can wear your jammies all day. What do you do to get through a storm? This entry was posted in 2013 on 2013/02/11 by Robin Botie.